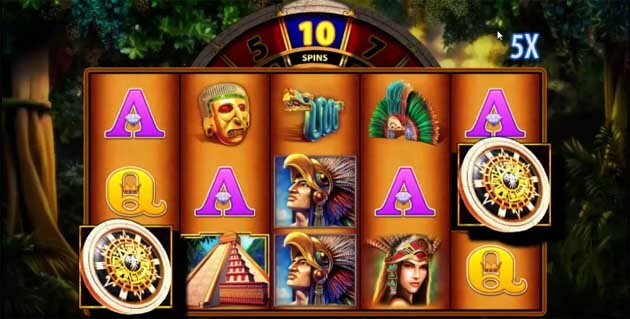 Monteuma is probably among the most well-known slot games by developer WMS – and with good reason, too. The game provides a very believable atmosphere and lucrative payouts, as well as uniquely exciting gameplay. You will find the backdrop depicts the lush greenery of a tropical forest, and the bird and other animal noises sound real enough to transport you to the jungles of Central America. And unlike in most games, where the soundtrack is pretty repetitive, this one is about as diverse as the wildlife in the rainforest. The developers have included four of the lower value playing card symbols in this game: A, K, Q and J. Following them is a number of beautifully designed icons with ancient Mesoamerican imagery. Starting with the famous Aztec Double-headed serpent, the value climbs up to a traditional gold mask. The value increases further at the flamboyant headdress – another typical attribute of that era. Next are the eagle, then a female and a male character. The latter is the highest paying symbol on the reels. 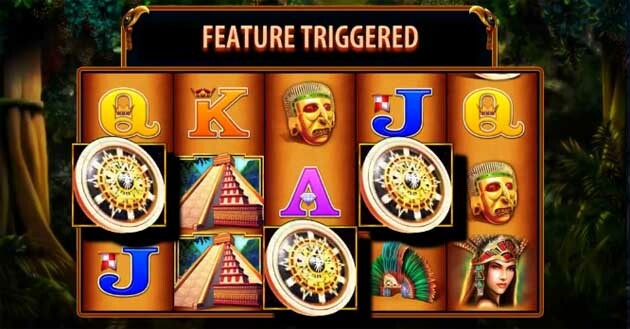 This slot features a 5 reel by 3 row layout, with an entertaining little additional feature. When you spin the reels, they tend to increase in size, coming closer to you. What’s more, the icons forming winning sequences will pop out of the screen and slide back in. There are 30 fixed paylines and players may select the amount they would like to bet per line. Thus, stakes can range from 30p up to £150 per spin. You can expect a theoretical RTP of 95.86%. Players will notice that Montezuma features a total of two different special symbols, each with its unique and fitting design. First of them is the Wild symbol, which can appear on the middle reels 2, 3 and 4. 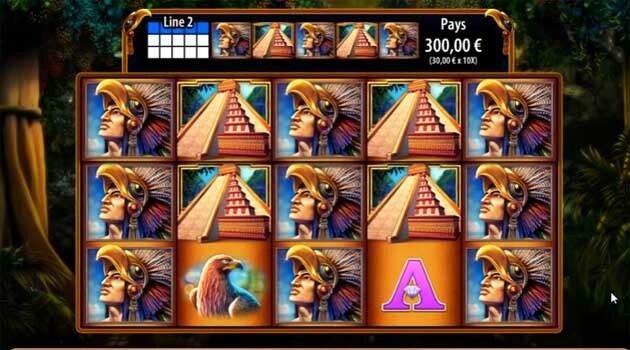 It showcases an ancient Aztec temple and can replace any of the regular symbols to help create winning combinations. The only symbol it has no jurisdiction over is, of course, the Scatter symbol, which appears here as the Feature symbol. It, in turn, appears as an accordingly styled shield and can show up anywhere on the reels. However, what’s more important about it is that it is responsible for triggering this game’s most attractive feature – the freespins. In order to activate the freespins bonus, you will need to land at least 3 Feature symbols anywhere on the reels. And in addition to those freespins, a wheel above the reels will determine the exact multiplier that you can receive for each specific spin. As for the number of freespins, this will depend on what the wheel will award you. And there’s a wide range to choose from. You can get anywhere from 3 to 10, 15 or 25 freespins. But that is by far not all there is. Before each freespin begins, another wheel will determine the multiplier for the wins from that freespin. You will have the opportunity of gaining a 2x, 3x, 5x or 10x multiplier! And as if that weren’t enough, you can also retrigger this bonus round to gain even more spins. And unlike with most other games that offer a re-trigger on their special features, this one doesn’t require you to land the full amount of 3 Scatters. Instead, you can gain additional freespins by only landing 2 or more Shield symbols. You can gain up to 25 extra freespins at a time. And to make things even better, the developers have hidden yet another juicy treat in this bonus game. All freespins from the retrigger will have the same multiplier you had during the spin that retriggered the feature. What’s more, this game has a Bonus Guarantee technology. This sees to it that players always receive at least 10 times their stake during the freespins feature. So, even if you were to win less than that amount, the game will automatically increase it to meet the guaranteed minimum. This is great news for just about any player out there, so you might want to consider this unique opportunity. 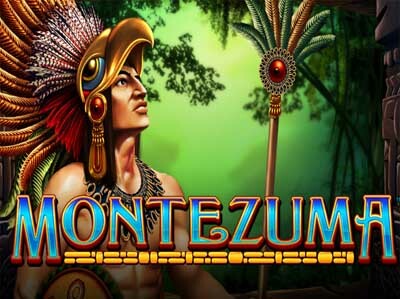 Montezuma is certainly among our most favored slot games, especially by this manufacturer. And it’s easy to see why it’s so popular among players. The design is truly enchanting, as is the overall atmosphere the developers have achieved in creating. We are also unapologetically in love with the bonus feature, not just because you can trigger it fairly often. We really like it also because of the guaranteed prizes and the ease, with which you can retrigger the freespins. As we already pointed out, all you need is 2 Scatters to achieve as much. Therefore, you can just keep on retriggering the feature multiple times. In fact, it’s not unheard of to land of 100 freespins during a single bonus round.